Odisha Board of Secondary Education (BSE) announced online process for Matric (10th) Result 2016 Rechecking & Addition of Marks. Candidates who are not happy with their result they can apply online for Recheck of Answer papers (Both Subjective & Objective) along with they can apply for Answer Paper copy for further reference. The online application for checking of addition of marks will be available in the website www.indiaresults.com from 02/05/2016 10.00 am till 11/05/2016 midnight. On visiting the above website, “LOGIN TO YOUR ACCOUNT” page will be displayed on the screen. The candidate has to enter his/ her Roll No & Password, if already registered. If not registered, the candidate has to click “Click Here to Get Password” so that “Step-I to Create Password” page will be displayed on the screen. The candidate has to enter “Roll No.” & “His/ Her Mother’s Name” in this page and click on “Submit” button to go to the next page i.e. “Step-II to Create Password”. In the page “Step-II to Create Password” the candidate has to enter a password of his/ her choice, Re-type the password, Enter Valid Mobile No. & E-Mail ID and enter his detail correspondence address with pin code. Thereafter click on the “Submit” button. On clicking the submit button a verification code will be sent to E-Mail ID of the user and the page “Verify Your E-Mail” will be displayed on the screen. The candidate has to get the verification code from their respective E-Mail ID and enter the same in this page and click “Verify” button. If the E-Mail ID is valid and verification code is properly entered, the data of the candidate will be displayed on the screen. It is important to note that the candidate has to remember his/ her password for further use and for receiving the photocopies of the subjective papers. If the candidate desire to apply for re-checking of some other papers, besides papers already applied, he/ she can re-enter the website as a registered candidate, using his/ her registered password. The data displayed on the screen shall show the marks secured by the candidate in both the OMR and Subjective Papers. The candidate has to click/ select the papers either OMR or Subjective or Both as per his/ her choice and also select for photocopy of subjective paper. In case photocopy is opted rechecking of subjective paper is mandatory. 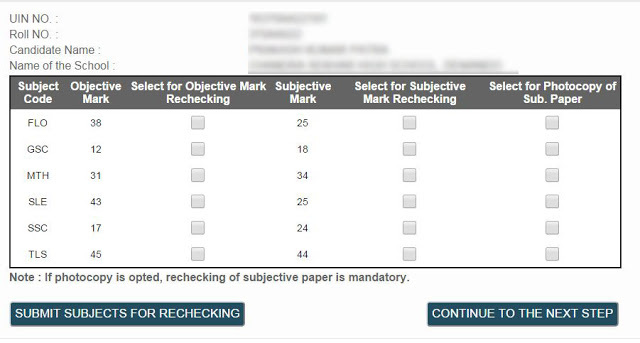 After selecting the desired subject for rechecking/ photocopy, the “Submit Subjects for Rechecking” button has to be clicked followed by “Continue to the Next Step” button. Thereafter the screen showing “Calculate Fee” will be shown which has to be clicked, so that “Generate Pay-in Slip” button will be displayed on the screen. Click on “Generate Pay-in Slip” button and take out the print copy of the SBI Challan. Deposit the fee as per the challan in the nearest State Bank of India Branch. Re-visit the website and enter the Journal No., Amount & Date and click on “Submit” button and take the print copy of the acknowledgement receipt. The process of application shall be completed provided the candidate takes out his/ her acknowledgement receipt. 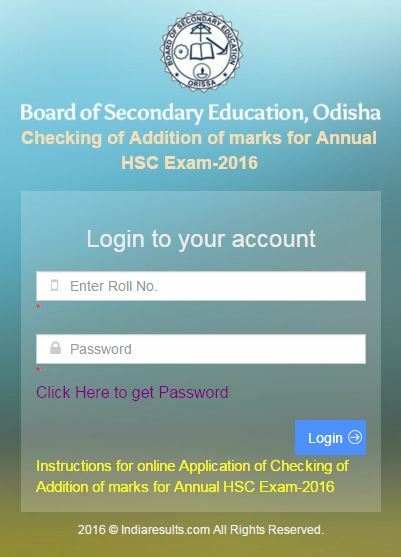 Give Responses for "How to Apply For BSE Odisha Matric Result 2016 Rechecking & Addition Online"